The UFC held a special press conference today, Feb. 18, 2015 to discuss recent drug issues and weight problems within the company. The conference which began at 1pm EST was held at the Red Rock Casino Resort Spa in Las Vegas and was headed by CEO of Zuffa LLC, the parent company of the UFC, Lorenzo Fertitta and UFC President Dana White. 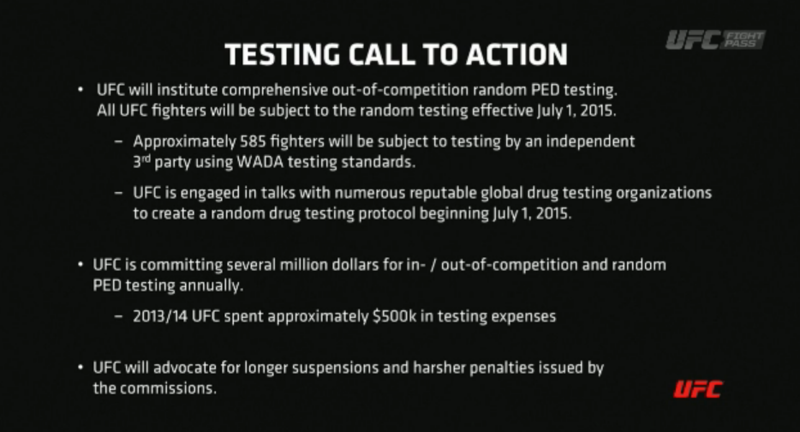 “We are extremely disappointed by the results of these drug tests,” Fertitta said. White explained the difference between Jon Jones recent failed drug test and other fighters. “Out of competition, you do not test for recreational drugs,” White said when he spoke about Jon Jones failed test for cocaine. White said Jones was fined for violating the UFC Fighter’s Code of Conduct and the money was donated to charity. “The Nevada State Athletic Commission would never let a fighter go in if they knew was on drugs,” White said. 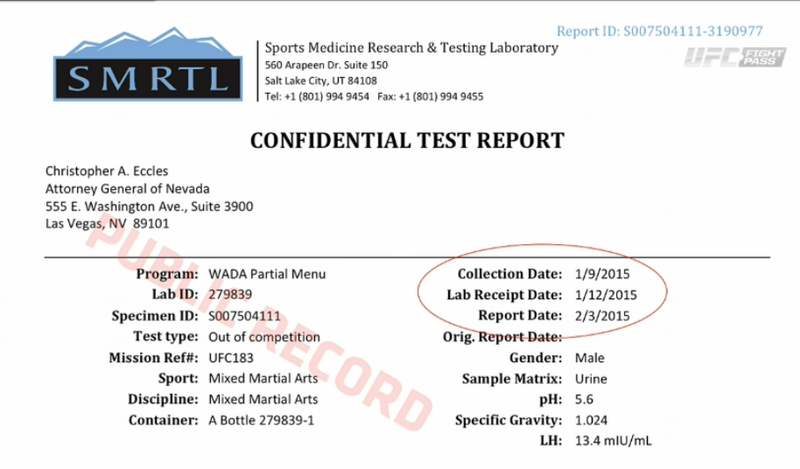 Here is a copy of Anderson Silva’s failed test. “Because of Hector Lombard’s failed test, Rory MacDonald will now fight Robbie Lawler for the UFC welterweight title on July 11 at the MGM Grand in Las Vegas,” White said. “Something needs to be done,” Fertitta said regarding the alarming rate of fighters testing positive for performance enhancing drugs. If there are additional costs associated with that outside the regulatory bodies budget, the UFC will provide assistance, he said. “If you are a fighter on the UFC roster, you will be tested in competition and out of competition and if you use performance enhancing drugs, you will be caught,” Fertitta said. “The current penalties that are being put forth we don’t believe are enough,” he said. Inside MMA’s Ron Kruck asked the panel if they truly do believe that they can get the entire world behind an organized set of testing. “We have to put these procedures in place to eventually make it better,” Fertitta said.